My co-author Eric Fettmann, who has read an advance copy of a new FDR book by Steven M. Gillon entitled "Pearl Harbor" discusses certain aspects of FDR's health. I'm told in particular he theorizes how Dr. McIntire treated FDR on a daily basis with nasal medicine for his "sinus" condition that contained cocaine. He further notes that a number of physicians confirmed that cocaine was commonly employed at this time. In the 1960's when I was an operating room technician, before med school, cocaine was routinely employed as an anesthetic for nasal treatments and still is today. The use of cocaine by FDR for "sinus treatments" is not surprising. We know, from readily available information that from mid-1939, FDR saw McIntire on a daily basis for "sinus treatments". I believe the only incorrect assumption is that cocaine was being used to treat FDR for chronic sinusitis. Cocaine is a powerful anesthetic and vasoconstrictor and was being used to combat the pain brought on by the constant irritation from therapy. 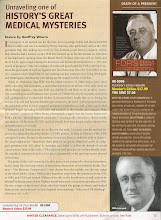 With the goal of affecting a slow cosmetic removal of the cancerous lesion, FDR had innumerable painful procedures over his left eye and in his sinuses, performed by McIntire Between early 1940 and late 1941. Daily use of cocaine obviously leads to addiction, ceasing use, brings about a"rebound" phenomenon, a nasal swelling and intense congestion begging for more cocaine. Mcintire had no problem obtaining cocaine for medical use. Yes, FDR was probably dependent on cocaine from 1939 on. The really interesting part is how it affected the other aspects of his health, i.e. his blood pressure, and even more so his personality and decision making. I would refer the reader to "An Anatomy of an Addiction" by Howard Markel, 2011, Pantheon Books, which provides an excellent and detailed discussion of the effect of cocaine on Sigmund Freud and William Stewart Halsted. It is a good basis for the non-medical historian to begin to understand how FDR really functioned. Unfortunately, the historical community continues assess Franklin Roosevelt as Howard Bruenn portrayed him and not how he really was. McIntire's continuous assertion that he rarely touched his patient is so much crap, he was a top notch physician and FDR always received the best medical care. McIntire knew how dangerous this was for FDR, he had not other options. Sometimes the best medical care creates addiction.